Includes cocktail hour and admission to event. * Beauty Battle is a live performance where Beauty Professionals are mastering and concentrating on their art in a allotted time frame. Therefore, we ask that the Audience attending be ages 15 and up only please. Includes admission, Meet and Greet, Pictures on Red Carpet, Cocktail Hour and Concessions. Red Carpet 4pm - Cocktail 5pm - Main Event 6pm. * Beauty Battle is a live performance where Beauty Professionals are mastering and concentrating on their art in a allotted time frame. Therefore, we ask that the Audience attending be ages 15 and up only please. Includes free admission to after party. * Beauty Battle is a live performance where Beauty Professionals are mastering and concentrating on their art in a allotted time frame. Therefore, we ask that the Audience attending be ages 15 and up only please. 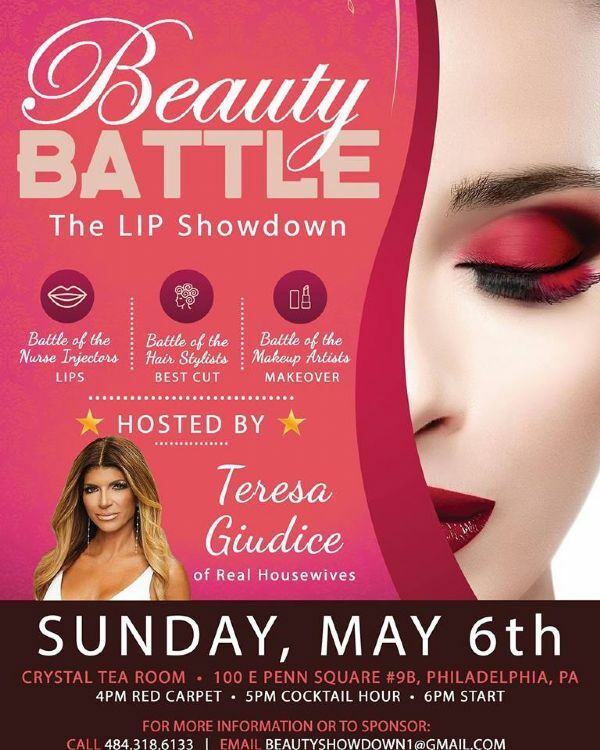 Liptuck Promotions presents the Beauty Battle LIP Showdown! Top notch ticket includes entrance to cocktail hour and after party General admission includes entrance to event and after party. Hosted by Real Housewives Teresa Giudice! $125.00 Red Carpet includes admission, Meet and Greet, pictures on carpet and Concessions. Red Carpet 4pm. Cocktail hour starts at 5pm. Main Event 6pm. $50.00 includes some concessions and free admission to after party. Questions? More Info? Call 484-318-6133. View More Events Organized by Lip Tuck Promotions. This event is organized by Lip Tuck Promotions.